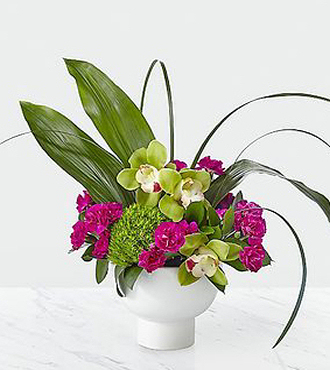 The beauty of this bouquet is in its artful combination of orchids, green trick dianthus, carnations, aspidistra leaves and ruscus. Each color was chosen to complement the others, which you can see has resulted in a stunning display that will turn heads wherever it is placed. STANDARD bouquet is approx. 17H x 17W.